We’re giving away ten pairs of tickets to attend a performance of Cirque Du Soleil’s Dralion that’s being held on Sunday, September 2 at Boardwalk Hall in Atlantic City. To enter, e-mail us your mailing address and we’ll pick winners at random. Cirque Du Soleil comes to Atlantic City with an astonishing fusion of East and West. 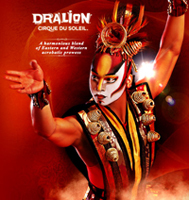 Dralion from Cirque Du Soleil, coming to Boardwalk Hall August 29th through September 2nd. Tickets at CirqueDuSoleil.com.